I received a free advance review copy from the author in exchange for your honest review. Oh WOW, this is my first book that I've read from Kayla & let me just say I was blown away! 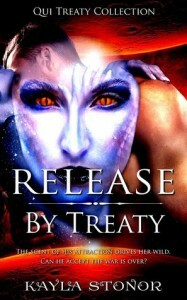 'Release by Treaty' was fast paced & full of sexual tension. It was very easy to read in 1 sitting & although it was a quick read, I really enjoyed the flow of the story & can't wait to read the next book in the series or anything else written by Kayla.